A new publication called “Puget Sound Fact Book” has been released online by the Puget Sound Institute, an affiliation of the University of Washington, Environmental Protection Agency and Puget Sound Partnership. Like its name suggests, the fact book contains detailed information about Puget Sound — from the geology that created the waterway to creatures that roam through the region, including humans. The fact book has been incorporated into the Encyclopedia of Puget Sound. 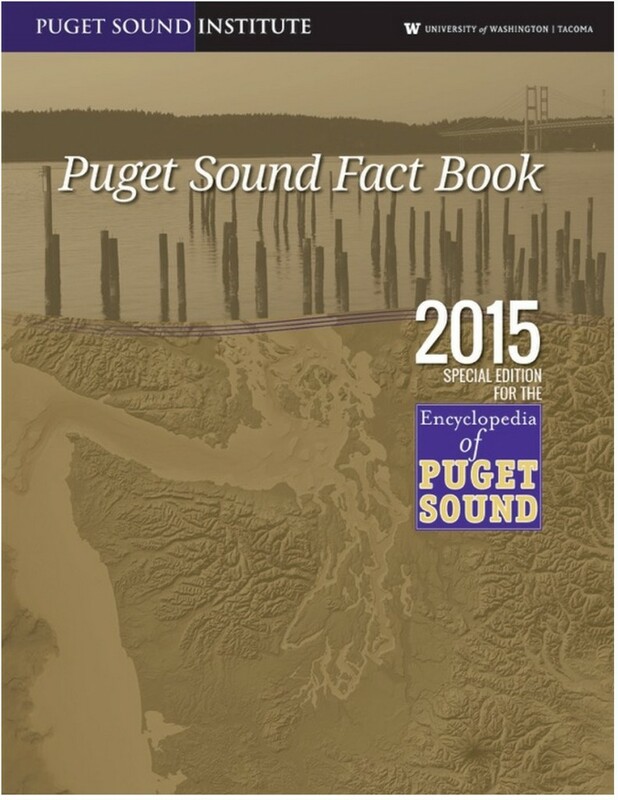 One can download a copy of the fact book from the Encyclopedia of Puget Sound webpage. Just for fun, I thought I would offer a multiple-choice quiz from the book. Answers and scoring are at the bottom. 1. Chesapeake Bay on the East Coast covers about four times the area of Puget Sound. The total volume of water in Chesapeake Bay is roughly how much compared to Puget Sound? 2. Puget Sound was named by Capt. George Vancouver, honoring one of his officers, Lt. Peter Puget. Where was the northernmost boundary of the original Puget Sound? 3. How deep is the deepest part of Puget Sound? 4. Washington State Department of Health has classified 190,000 acres of tidelands in Puget Sound as shellfish growing areas. How much of that area is classified as “prohibited,” meaning shellfish can never be harvested there without a change in classification. 5. In the late 1800s, experts estimate that Puget Sound contained 166 square kilometers (64 square miles) of mud flats. Development has reduced that total to how much today? 6. How many bird species depend on the Salish Sea, according to a 2011 study? 7. Resident killer whales eat mainly chinook salmon. What do transient killer whales mainly eat? 8. Most fish populations in Puget Sound have been on the decline over the past 40 years. What type of marine creature has increased its numbers 9 times since 1975? 9. Rockfish are among the longest-lived fish in Puget Sound. How many species of rockfish can be found in Puget Sound? 10. Puget Sound’s giant Pacific octopus is the largest octopus in the world. The record size has been reported at what weight? 1. C. Chesapeake Bay contains about half the volume of Puget Sound, some 18 cubic miles compared to 40 cubic miles. 3. C. The deepest spot in Puget Sound — offshore of Point Jefferson near Kingston — is 286 m, although one spot in the larger Salish Sea (Strait of Georgia) reaches a depth of 650 m. or 2,132 feet. 7. B. Transients eat marine mammals. 10. D. 600 pounds is said to be the record, although more typical weights are 50 to 100 pounds. Most of these questions are pretty tough. If you got five right, I would say you know Puget Sound pretty well. Six or seven right suggests you have special knowledge about the waterway. More than seven correct answers means you could have helped compile the facts for this new book.